Faulty and ageing wiring is one of the major causes of electrical fires in the home. It is important to assess the age of your wiring and the condition of your cables, switches, and sockets. Your home may require re-wiring to ensure it meets the necessary standards for safety. 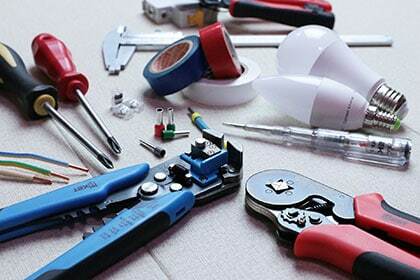 You will need to consider upgrading the wiring in your home if you have not done so within the last 25-30 years. Electrical installations in domestic properties, built before the mid-1960’s, are prone to various electrical faults which can cause significant safety risks. Lack of A Residual Current Device (RCD) – A device designed to protect electrical circuits to prevent direct contact electrical shocks. Old wires & Poor Connections – Old wires and insulation materials that perish and corrode over time causing overheating and pose a fire risk. Lack of Basic Earthing – Inadequate or missing Main Earth cables. Lighting circuits did not have Earthing until 1967. Earthing is necessary to prevent shocks and fire hazards, providing a path to automatically disconnect dangerous currents. Old Switches & Sockets – Plugs, sockets, and switches have been developed over time to maximise safety, prevent overheating and prevent shocks. Old electrical installations may have very accessible circuits or exposed wires. This particularly poses a risk for the safety of children. Safety and fire prevention continues to influence changes in legislation. There have been significant advancements in electrical installations since the 1960’s which are designed with safety in mind. It is likely that old installations are inadequate to deal with the demand for electrical devices in your home and will require re-wiring. The best advice is to have a qualified electrician to carry out an Electrical Installation Condition Report (EICR) to assess whether your property needs re-wiring. If you are adding to your existing installation or making significant alterations, it is essential that you consult an electrician to ensure you are legally meeting building regulations.